This is a wonderful time of year. Yes, last Monday was meant to be the most depressing day of 2009 (cold, short days, post-Christmas and the middle of the month). But the runway show season has started. Not that I get to go to the shows. Nor that I find the shows themselves that inspiring – not consistently anyway. But I love Scott Schuman’s photograph’s of ‘the off-runway scene’: what all the people attending the shows are actually wearing. This year’s selection started on Saturday in Milan. I recommend going here and starting at the beginning. 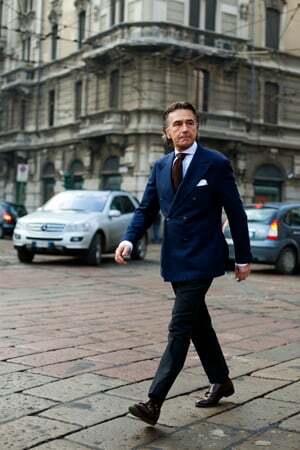 My personal favourite from this collection so far is Gianpaolo Alliata, striding across the paving stones in a double-breasted blue blazer, brown tie and white handkerchief. Below, he wears dark-grey trousers, ever-so-slightly short, and chocolate monk straps. A masterclass in simple yet effective dressing. There is zero pattern on display, which you’d think would make the outfit appear dull, uniform and without highlight. But the cut is precise – cut above all, fit above all, the Italian maxim – that it all seems supremely balanced and packaged. I also love the portrait of Lino Ieluzzi. Posing next to a picture of himself in bandana and navel-exposing shirt, Scott rightly points out that Ieluzzi doesn’t take himself too seriously. Which is wonderful attribute to have in a stylish man, akin to someone who always seems perfectly attired yet never adjusts his pocket handkerchief. Select them with care and then forget all about them, as Amies would say. Particularly fascinating about Ieluzzi is that his style is still identifiable several decades later. Even without the super-tight trousers or big collar that very specifically date the photograph, there is consistency in the approach to clothes. The simple colours. The open-necked blue shirt. The cocksure pose and the wispish hair. Little has really changed – he’s just grown into a style that is more mature and less of its era. As always, it is interesting to see how particular people dress at particular shows. The monotone man going to Costume National. The Burberry couple that look like they are actually in a Burberry advert. I can’t wait for the Ralph Lauren show – the people Scott shoots there actually seem more RL than the models on the catwalk. As if the dream that Lauren tells everyone he is selling has been filtered down through a dozen different personalities. I also recommend subscribing to the RSS feed available on the same page. It’s a little drop of inspiration every day. You can follow the discussion on A drop of inspiration every day by entering your email address in the box below. You will then receive an email every time a new comment is added. These will also contain a link to a page where you can stop the alerts, and remove all of your related data from the site. I enjoy your blog. I hope you don’t mind me throwing in an opinion. With regard to the first man. If it’s a case of ‘fit above all’ how can he be deemed to have got it right if his trousers are too short? 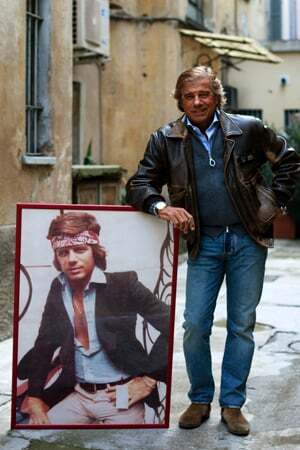 As for the second, I am not sure if any man of his age looks right in the jeans/bomber-jacket combination. Guys like this look like they are trying too hard to hold onto their youth in my view, even if the clothes are good quality and he has the physique for it. It’s a young man’s look I feel. Ants – I welcome any comments, thank you for them. Trouser length is matter of taste to a certain extent, and I think you would find that if this man at the top were standing still, his trousers would just be touching the tops of his shoes, which is a preference with a lot of Italian men and one that has gained ground elsewhere recently. I prefer mine slightly longer, but only by an inch. As to the second gentleman, I can see your point but again I think he pulls it off. If he were wearing tighter, narrower trousers or were more overweight I think it would fail. The “off runway” scene is so much more interesting right now. Yesterday I was looking at swide.com (the Dolce and Gabbana web-site) and thinking what the models look like backstage is so much more inspiring than the catwalk (which seemed very hyper-styled late-Ford era Gucci). Italians particulary are defining a “classical” street style that has little to do — ironically — with the Moda they promote. Shorter pants, white tight jeans, piumino vests, sweaters tied over jackts, driving shoes… you get the picture.